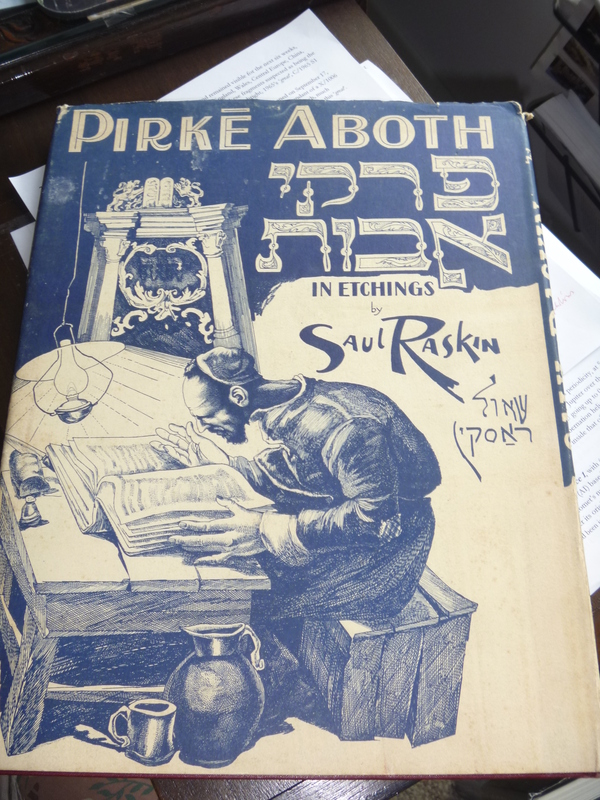 We sat uncomfortably in the classroom, rocking from side to side, trying to absorb the Hebrew text of Pirke Avoth. This portion of the Mishnah claims that Moses carried not only a hard copy of Torah down from the mountain, but an interpretive oral tradition as well. The latter was chewed, memorized, and repeated from mouth to ear for more than a thousand years. When it was finally committed to writing in the early centuries of our own era, the achievement for Rabbinic Judaism was enormous. The sayings of the fathers was frozen for all time. Future students would have much to ponder. Pirke Avoth. Image from here. Professor Bluestein cruised through the details. Some of these “fathers” I knew. Hillel and Shammai jumped off the page. Others, such as Nitai the Arbelite, were strangers to me. The single quote attributed to Nitai is edgy: “Distance yourself from a bad neighbor, do not cleave to a wicked person, and do not abandon belief in retribution” (Avoth 1:7). Life must have been tough in Hasmonean times. This was my literary experience more than 25 years ago. 1903 map of Eastern Galilee. Horns of Hattin (red), Arbella (yellow), and Magdala (blue) are circled. Note the path of the highway that passes by each of these villages. Map is from here. Today I hike the Jesus Trail and stand amid the remains of Nitai’s home town. The Galilean Arbella (Irbid) huddles on a stone shelf suspended above the Sea of Galilee. Nearby, cliffs drop precipitously to the sea. Known as Mt Arbel, these cliffs (the edge of the African plate, geologically) recall the name of the town. The route of the International Coastal Highway passes through the Wadi Hamam (“Dove Valley”) below. View from the Sea of Galilee to the cliffs of Mt Arbel (left of center). Arbella rests on the plateau above. The Wadi Hamam yawns in the center and Mt Nitai, named after the famous teacher from the pages of Pirke Avoth, looms to the right. Little of Arbella itself is preserved, the site is overbuilt by centuries of human settlement. A modern moshav (collective) connected with the name Arbel represents the latest embodiment of Galilean agriculturalists. It is built on land confiscated from Arab owners in 1948. Old architectural fragments in basalt and limestone are visible here and there. While relaxing last night I walked out of the moshav and found the head of the “Green Trail” in the adjacent national park. I didn’t have to work too hard to locate the Arbella synagogue. The remains are perched on the edge of the descent to the Wadi Hamam. A late afternoon view to the Arbella synagogue. the Wadi Hamam separates the plateau of Arbel (forground) from the plateau of Nitai (background). The term “synagogue” is derived from the Greek language. It suggests a place where people “learn together.” One can imagine the synagogue as a place for study, public teaching, fellowship, and prayer. Remarkably, Ashkenazi Jews still use the term schul (= German, schule; English “school”) to refer to the synagogue. Akin to the term “church” in usage, a “synagogue” refers more natively to the collecting of people, not stones. Only secondarily, does the term suggest a dedicated structure. This principle must be remembered when reading New Testament texts, as early identifiable synagogues are quite rare across the Heartland. By the Byzantine period, however (several centuries after the New Testament was completed), identifiable synagogues blossom in Galilee. Now, by morning light, I explore the Arbella synagogue more throughly. It must have been quite grand, measuring more than 18 meters per side. The entryway was carved from a single stone. View to the entryway cut from a single stone. The modern bench sits inside it. I walk in. A modern bench invites me to take a contemplative seat. I rest among three rows of standing columns. Fresh excavations around the synagogue suggest the work of Israelis. The work of the Germans, H. Kohl and C. Watzinger, from the turn of the last century (1905) are harder to imagine. Still more distant are visits to the place by the British mapmakers, Kitchener and Conder, as well as the American geographer of the Bible, Edward Robinson. All noted the ruins of this Byzantine synagogue. Pushing my imagination to the limits, however, I envision those who once sat in the four rows of stone seats that surround the place. They are bearded and wear robes, hats, and prayer shawls. This is not the synagogue of Natai, but certainly the synagogue of his successors. Prayers were offered in this place. Torah was recited in this place. Bad neighbors, wicked people, and the possibility of retribution were contemplated in this place. I do the same. Then I rock from side to side and ponder Professor Bluestein’s passion for Pirke Avoth.